The home has been all updated when we purchased in 2002. There are hickory wood floors on the main level and frieze carpet on all the other levels. There is a bathroom on each level with tile flooring. The home is inviting and a comfortable place to have a weekend get away! There are two flat screen television located in the two family room areas. There are three level to the home. The first level has a great room with a stonewall fireplace, full kitchen, harvest eating table, and a bar height counter top that will eat 4 people comfortable. There is a screened porch, and a deck with a view of the beautiful golf course on the main level. The bedroom has a queen size bed in bedroom and a full bath with tub and shower.The lower level has Laundry facilities, Full bath with tub and shower, Family room area with a screen door opening to the patio where the fire pit is located. The family room has a three cushion sofa and a chair and a half the are sleepers, these will sleep 3 people comfortable. The Bedroom on this floor has two full size beds in order to sleep 4 people. The upper level has a Bedroom with Queen size bed, a loft area with a Twin bed and a Full bath with a shower only. The home is decorated in a rustic decor, the exterior view is of the third hole of the north golf course. There is a weber gas grill for grilling pleasures that is located on the ground level patio. Groceries: The drive to Galena coming from the east is a very pleasant drive. You travel in a US Rt 20 which is a two lane highway. You travel thru many small towns such as Lena, Elizabeth, Stockton. There is a grocery store in the town of Stockton by the name of 'Sullivans Foods', this is a great place to stop and stock up on reasonably priced groceries as you are arriving. In the territories there is a general store for necessities, there is also a wonderful deli and bakery and meat counter here. They do also rent more current videos here for a 24 hour time period. You can also stay on Rt 20 past the turn to get downtown galena and there is a Piggly Wiggly and a Walmart super store. Gas at the Walmart is usually cheaper. Short cut to town: When driving out of Green View Lane you want to take a left on to eagle ridge dr. and then your very next left on to thunder bay from here you will drive about 2 miles you will see the trash facilty on the left side just before that there is a farm road that will take you out to Rt 20 again. This will cut down your drive to town at least 15 minutes or more. House essentials: When you arrive at the house you will need to turn on the water which is located inn the laundry room on the lowest level. Behind the door you will see a faucet, you need to open that valve when you arrive and close that valve when you leave. The thermostat has been programed for the heat and the cooling. When you arrive you need to open the cover and push run program and when you leave if you could set it at 55 degrees in the winter and in the summer at 80 degrees. I have a well stocked kitchen for your use, pat and pans, dishes for a service of 8 people, coffee pot, tea kettle,silverware, cutting knives, toaster, a few serving dishes, cutting boards, measuring cups, few spices, salt & pepper, sugar, paper towels, dish towels, dish soap, cleaning supplies. Let me know if there is any questions about any other items. The bathrooms have toiletries, body soap, hand soap. I also have laundry soap if you need to wash a few things in the new front load washer & dryer. We purchased the property for our own families use. As our family grew and we weren't able to spend as much time there, we decided to share our home with others. It has been a wonderful experience getting to know others who have come to enjoy the Galena area as much as we have. The continued revenue from visitors has enabled us to continually care for the home and made it a wonderful place to enjoy your time away from home anytime of the year. The nice thing about this property is that it has a wonderful view of the golf course and yet very private. The area provides great outdoor activities all year round. Boating, Fishing, Golfing and Hiking in the spring, summer and fall. Skiing in the winter season and relaxing by a cozy fire. I believe the most unique benefit to this property is it's location it is centrally located in the Galena Territory Area. It is about 5 min, drive to the Eagle Ridge Inn which is convenient for many of our guest who are attending weddings at the Inn. There is a back way to town that is about 15 min. drive, also a 5 min. drive to the homeowners club. The homeowners club is where you will find the indoor pool all year around as well as the workout facility. The Indoor pool is open year round at the homeowners club also. A bathroom on each level of the house, lower level tub and shower. Main level tub and shower, upper level shower only. I provide toilet paper, hand soap and body soap. A old Stagecoach town, the De Soto House is a hotel that once was used for travelers on the stage coaches traveling through the Galena Area. The house is located around many beautiful trees along the golf course which make the area very private and provide beautiful color in the fall season. Lake Galena is a fishing lake only, there are only there is no water skiing boats on this lake. This makes it a very relaxing and wonderful experience. Located close to the Mississippi river, where the chestnut ski lodge is located and you have beautiful views of the river all year around. A view of the third hole of the north golf course is what you will see out the back of our property. Newly installed stainless steel dishwasher. A refrigerator for your use, no ice maker, trays to make ice for your needs. Service for 8 dish ware, more services of silverware. Glass ware available, pots and pans, toaster, knives, wine openers. We have a newly updated kitchen with stainless steel appliances, available for your use. I recently installed direct TV with 20 channels, we have a flat screen television on the main level of the house. I have a few classic DVD's that can be watched in the end table on the main floor of the house. There is a homeowners facility which has a outdoor pool between the memorial and labor day weekends in the summer. There are amenity tags for your use located at the house. The house is decorated in a rustic colorado decor with a 2 story wood burning fireplace. 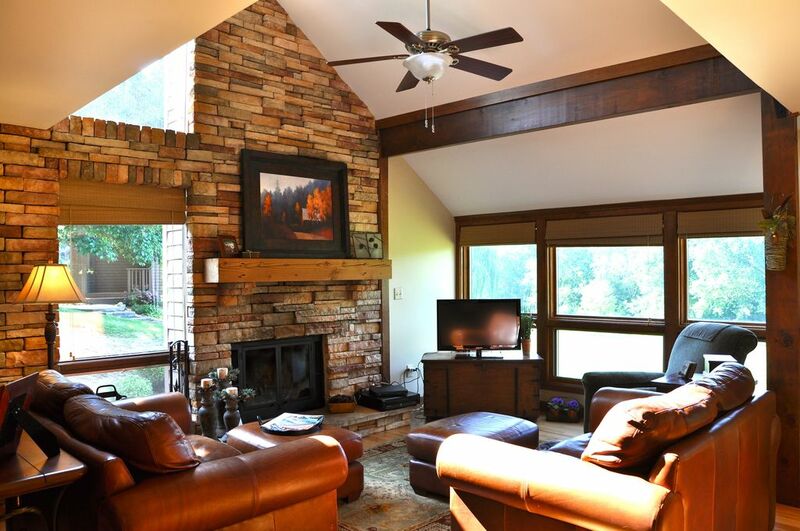 The main level familyroom has a new flat screen television, vaulted ceiling, leather couches and a cozy reclining chair. The kitchen has cherry cabinets with granite counter tops, all new stainless appliances. It can comfortable seat 10 people 6 at the harvest table and counter seating for 4. There is a screened porch with table and chairs that seat 4 people. Also a wood deck with a weber gas grill and a golf course view from the two back decks. The lower level has a familyroom with TV and dvd player. There is a sleeper sofa with an air mattress and a sleeper chair and a half and a walkout basement to a wood deck. On this level is also a laundry room with new front load washer and dryer with laundry soap and softener for your use. Great place for a Ladies’ Weekend! The house was perfect! Great location, very clean, comfortable beds, pretty view, fully stocked kitchen, and the owner was easy to get in touch with and responded promptly to questions. So glad all of you had a great weekend! Thanks so much for letting us know and writing this great review! Please look us up when you are in the Galena area in the future! A lovely home in a beautiful setting. This was our first visit to the Galena Territory. This home had everything that we needed. The owner was quick to respond to any questions I had. We will definitely return and choose this home again. We are so happy all of you enjoyed our home! We so enjoying having guests enjoy our home the way that we do. We look forward to hearing from you in the future! Thanks for posting this wonderful review! I believe this is the seventh year we have stayed at the Galena home of Sandy Spence. It’s a reunion for s ven college friends from Colorado, Mpls., Michigan and Iowa. Plenty of beds for us all and the home works out perfectly. Highly recommend these accommodations. We had my two sisters, two sister in laws and my mom and me together for a girls weekend and we loved this property. Very spacious and comfortable home and only a five minute drive to the Eagle Ridge Resort where we enjoyed the spa treatments. Downtown shopping area only a 15 minute drive away, so the house location is so convenient. We had everything we needed at the home with bedding and kitchen, so a very homey setting and beautiful view. We have already talked about returning next year! Loved it. Perfect place to spend a weekend! Beautiful home! It was a perfect weekend for a group of friends for over 36years. Plus, the weather made it even better. The screened in porch made morning coffee delightful. It was more than spacious and extremely well-kept. Thank you for allowing us in your beautiful home! We are so happy you guys had a great weekend! Thanks so much for posting your nice comments on our website for others to see, it is greatly appreciated. Very well appointed rental. Had lots to do for the kids and the grandparents. Loved the balcony and the terrace. The lawn was perfect for the kids to run in. This property is located in the galena territories, a unique golfing community with many family activities! It is about 15 minutes from the town of galena which is an old stage coach town along the Mississippi river. The town is full of little shops and restaurants that is set into the hillside. There is lots of wildlife in the area, many species of birds, wild turkey, & deer. There is an Inn at the territories where there is a spa for your leisure enjoyment, also a gift shop and a main restaurant and a bar restaurant. There are many events throughout the year organized in the area such as a hot air balloon events, civil war days, etc. You can also rent a pontoon boat and enjoy a sail around lake galena. There is also a stable where you and your family can enjoy a trail ride or a rodeo over the 4th of July holiday weekend. There is a new local hospital in Galena. You are about 30 minutes from the border of Dubuque Iowa, there is a gambling boat & other site seeing attractions. Golf: There are four separate golf courses in the Galena Territories. There is the north course the south course and a short 9 holes course and also what is called the 'General' a more difficult course. I am not a member of these courses, but you can easily set up tee times in the golf season. Ski: Our home is about 10 miles away from chestnut mountain that overlooks the Mississippi river. There is ski rental there in the winter and in the summer they have an alpine slide that is great fun for the whole family. In the town of Dubuque on the other side of the Mississippi there is sundown ski resort. They also have rental facilities, for your skiing pleasure. Security Deposit of $250.00 in a check form along with a signed contract required. If checking in on a Sunday, cleaning fee will be $100. We accept credit cards, and also Pay Pal. Three night Min. for Holidays, Christmas, New Years, Easter, Memorial Weekend, 4th of July, Labor Day, Columbus Day, Thanksgiving.